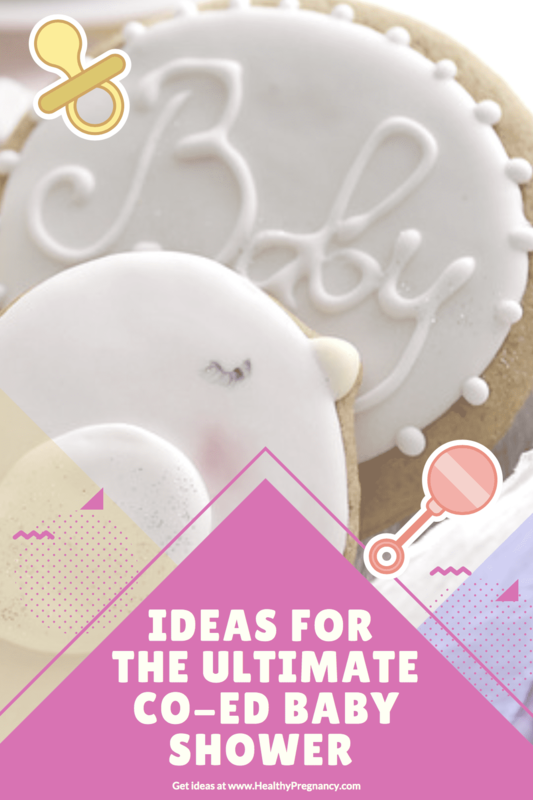 Babies provide the perfect theme for celebration and there is not a reason to limit the festivities to only include one gender. A co-ed baby shower allows everyone to share in the fun and anticipation. If you are planning a shower of this nature, keep in mind that it is best to adapt the party to feel all-inclusive rather than just inviting males to a traditional females only event. Read on for some great suggestions. Speak with the parents to be about whether or not they would like to incorporate the baby’s gender and/or name. If so, this may set the stage for the decorations. If the baby’s gender and name are part of the celebration, consider using this information to create the baby shower invitations and decorations. While there are ready-made kits available, it is also fun to create themes such as little man, little princess or even to use a focus color and the baby’s name. Guests can bring gifted baby outfits to hang on clotheslines as a visual reminder of the little one to come. Consider handing out tongue-in-cheek party favors such as baby boy or girl chocolate or gum cigars, or even creating your own fake cigar favors using packs of Rolos candies and pre-printed label wraps. Consider garnering game ideas from both parents to be and considering have both a male and female game host. Plan a variety of games that balance action with humor and fun. Make everyone feel involved by asking guests to bring their own baby photos and posting them around the shower venue. Play a game that involves guests attempting to match party guests with baby photos. Create a quiz game ahead of time incorporating information about the Dad, Mom, and the baby-to-be. Have guests work in pairs to complete quiz answers. Another fun game idea requires the use of two baby strollers and baby dolls. Set up an obstacle course and see which team can safely and speedily wheel their stroller and doll through it first. If the party is held outdoors, fun games such as partner sack races or corn hole could also provide entertainment. Don’t forget to include game prizes that appeal to both genders and a variety of tastes. In this manner we dont feel ist. Check with the parents-in-waiting about any food allergies for themselves or guests. Picnics, potlucks and baby-honoring menus are all popular options and pave the way for seasonal and favorite foods that appeal to a wide variety of people. For a picnic, appoint a grill master, or go with a barbecue spread and variety of hearty salads. For a potluck, put a fun twist on the meal. Host a breakfast potluck or a guess the gender potluck where guests bring food in a certain color scheme. Another idea is to offer an appealing spread of pint-sized finger foods. Offer items such as tasty chicken wings, pizza sticks, fruits and cheeses and mini cupcakes. Speak with the parents to be about whether or not they would prefer both non-alcoholic and alcoholic drink options. From start to finish, consider all party guests as well as the focus of the festivities. Be sure that invitation wording leaves no doubt that everyone is invited and that the party will be a fun occasion for all. Get guests in a cohesive spirit by inviting everyone to sport a bow tie or certain color per the theme. Save detailed discussions about labor for another female outing and just relax and enjoy the chance to celebrate new life.